The Neurorobotics Research Laboratory (NRL) is located at the Beuth-Hochschule für Technik Berlin. 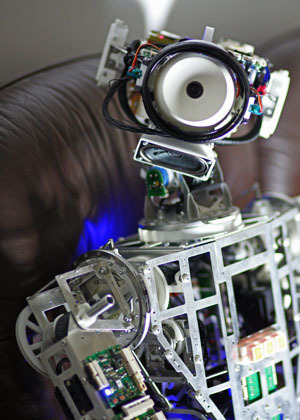 We develop and research morphologies and distributed neural systems for autonomous robots. We are interested specifically in adaptive and robust behaviors. Adaptive here means that the behaviour can adapt to the environment and to the body of the robot. Therefore, it is essential that robots are allowed to move freely within a real Environment (which in technical jargon is called Embodiment and situatedness). The investigated morphologies and controllers are developed in analogy to the nervous system of humans and animals, i.e. the sensorimotor control loops are intended to mimic the structure and dynamics of a brain to a certain abstraction level. With our newly developed Myon we present the world's first humanoid robot whose body parts can completely be removed during the operation and flange-mounted again. All body parts retain their separate functionality because they are autonomous in three ways: energy supply, computational ability, and the neural network itself are completely distributed over the decentralized robot. This has many advantages for research, for example behaviors such as walking can first be developed on an isolated limb (single leg) and can then be continued bit by bit and turned into a complete behavior. In addition, completely new issues arise - what happens if two robots exchange their arms or a robot receives a new, untrained leg? Myon system is a system with a very high degree of complexity. Even though, his behavior does not completely collapse when being harmed (for example, if a cable is cut or parts of the electronics are removed). The limbs are multi-crosslinked and work together cooperatively. Not only Myon, but the whole team of the laboratory is following this principle. In addition, as far as the appearance of Myon concerns, intensively worked together with Frackenpohl Poulheim and Bayer MaterialScience.